Hotate kaibashira is dried hotate scallop. One top of eating as is raw, it can be used to make fried rice and well as many Chinese-style dishes. It is a high protein low fat source of potassium, magnesium, phosphorus, and zinc containing the same amount of cholesterol as shrimp. 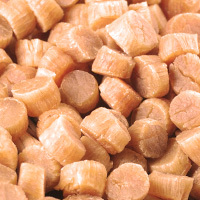 The calories in Scallop Kaibashira per 35g(1item) is 113 calories. Scallop Kaibashira is calculated to be 322Cal per 100 grams making 80Cal equivalent to 24.84g with 23g of mostly protein、2.66g of carbohydrates、0.49g of fat in 35g while being rich in vitamins and minerals such as Vitamin B12 and Sodium.